Captain Graves sighed heavily to himself as he reviewed the files on his Padd. Their inventories were running low and the Corinthian was continuing to drain resources faster than he could empty a bottle of Scotch. “Morning…” Commander Morrow called out as he stepped into the Captains ready room which was a poor choice of name for it in this case as the Captain was rarely ready for anything and was largely a waste of the room he took up. “Hi.” He replied with a curt nod towards his old friend. “I’m glad it’s not.” Morrow frowned slightly, wondering if the Captains Klingon side was rearing its head. The Captain smiled broadly, nodding to himself as he did. “I have something I’ve never shown you.” He said, with a low voice. “Go on…” Winston said softly, unintentionally mirroring his tone. “Something like that.” The Captain nodded as he picked out a Padd from inside the tired old ornament. “What is that?” Morrow’s eyes fixed on the old data Padd. 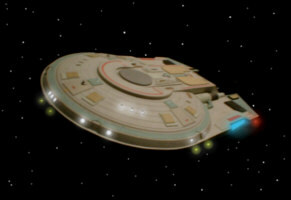 It was nothing special, just a standard unit that had been used widely in the Federation for years. “What’s on it?” Morrow smiled thinly, an awkward expression of total curiosity. “A Ferengi diary?” Morrow looked confused. “SO what then?” The Commander asked. “I’ve heard about that.” Morrow nodded. “I’m listening.” The Commander sat back in the chair, waiting for the story to begin. There are only a few of us left now. I took a patrol around the hill, watching out for the enemy. Out of the three of us only two still have weapons, and one of them is only a personal laser. Supplies are short all round but we’re luckier than most because we’re defending the homesteads so at least we have almost enough to eat. Morale is low, very low. None of us have ever seen an enemy like this or even an alien before. They came in ships from light years away, we don’t really know where. The first of them landed in one of their small vessels, I actually watched a broadcast of that three years ago. At the time we were all hopeful. First contact with an alien race was something we’d all thought was unlikely but secretly we’d all been waiting for this day in our hearts. They looked so alien to me when I first saw one. You could see just from looking at them that they came from another world, it was just amazing. Then came the first attack. The skies lit up red on the first day. I watched in silence with my family as the heavens burnt above me, flames swallowed the sun and birds fell from the air, smoking and dead. It was the first time I had ever seen my father cry. “That’s terrible.” Commander Morrow agreed with a troubled frown. “Is there more?” The Commander sat back in his chair, crossing his leg and folding his arms over his chest. There are only two of us left. I had to watch my friend die, he had been hit be weapons fire and the force of the blast threw him to the ground. I had grown up with him. We had even dated the same girl once. It hadn’t been at the same time but it still drove a bit of a wedge between us and we’d drifted apart. Watching him lying on the ground like that I realised how little any of that actually mattered. Life and death was all that’s left here now. The beams had just come out of nowhere. We didn’t see who was firing on us; they were probably many miles away. We weren’t even soldiers to them, just symbols on a screen; targets to be knocked down. They never had to see the horror they caused the fear and pain that we could never forget. There were only two of us left. My partner just stared as my old friend fell silent, his face contorted in agony. When he died all he could say was that at least we had a weapon each now. I suppose there’s only so much of this you can take before it becomes routine, before a part deep inside you dies and is lost forever. “I guess that’s war…” Captain Graves looked up from the Padd, a sorrowful expression on his face. “Which is how it should be…” The Commander nodded enthusiastically. “Go on…” He said. He didn’t want to hear it; he didn’t want to know how it ended. There was the intonation of a grim finality in the idea of a final entry to a soldier’s diary but his morbid curiosity compelled him. I was captured. They caught me this morning as I was retreating to join another group. I was the last one left alive anyway; they chased me away from the homestead in a machine. I’ve never seen anything like it, it had legs of a sort and weapons bristling from the front. It crept along behind me with an alien face peering out through a window at the top. I’m in a cell now, alone and closed away in darkness. They took my weapon away but the power-pack had died already. It was almost exhausted when I took it from a fallen comrade who had used it to cover my escape before these animals could kill us all. I don’t know what is going to happen to me. They forced me into this box, I was too exhausted to fight them in any case. There is the smell of death here, I don’t expect to ever see daylight again. The machine had pursued me into the undergrowth. It had torn down everything in its path to get at me. I remember falling to the ground. Everything was moving slowly, as if in a dream. I could feel the pain inside my body but by then the fear had driven it to the back of my mind. I just couldn’t take any more in. I felt the mud beneath my fingers, moist and cold in the heavy morning air. I remember looking to my fingers and they were covered with blood. I thought I’d been hit, I couldn’t remember why I’d fallen then, maybe I’d been shot in the leg with their powerful weapons? I gazed at the blood and then dimly I began to realise that the blood wasn’t mine. It was all around me, the ground was running thick with it from the group I’d been heading to see. These aliens had slaughtered them all. My family, my friends and my colleagues alike were now all dead and the only thing left was a macabre memorial that I had fallen into. The machine towered above me as I looked up. Then fear gave way. There was nothing left in me to live for and so there was no fear in death. I was angry but my weapon was out of reach so I was an animal with no claws. I shouted at the machine to fire on me and the alien face of one of them came to the window. It looked at me with its strange eyes and I could see it felt nothing. I was just in its way, my life meant nothing. We hadn’t been able to mount a defence against them. They were ferocious and determined. Their orbital ships bombarded us with weapon fire until we were smashed and still they came to drive us to the very brink of extinction. I was shouting but the words hardly seemed like my own. I was hysterical, thrashing about in the blood of my kind and cursing their home. I knew nothing about these people and they knew nothing about us and nor did they seem to care. All I knew was their name and the name of their accursed planet whose honour they claimed to fight for. I cursed them all back to their damned home while I lay defeated at the feet of the massive war machine and there was no feeling left in me but hatred. Damn their Earth. Damn these Humans!